Image above: MBTC N1 / 2018, Digital Archival Print on Watercolour Paper, Produced in Microsoft Word, 84 x 130 cm. Shaheer Zazai makes prints in Microsoft Word, using the keyboard as his drawing tool and the highlighter to add colour. 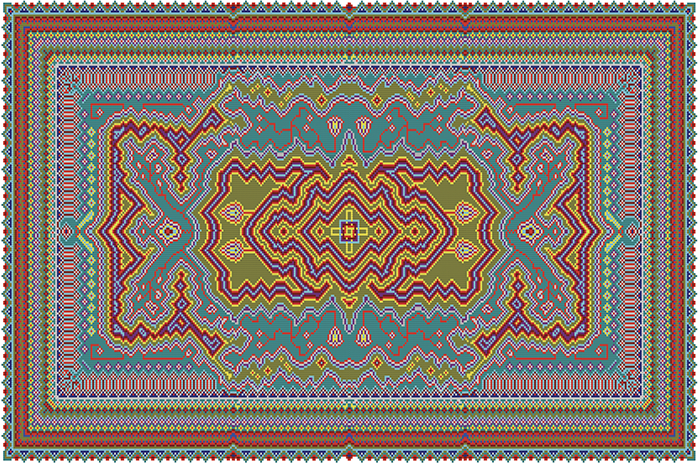 The resulting images are designs that recall Afghan carpets but are also uniquely his own. "The intended beginning of the project was never, 'I'm going to make carpet designs,'" he says. "But then it started forming because the designs started going in that direction." Toronto-based Afghan-Canadian artist Shaheer Zazai is a painter and digital media artist. He received his BFA from OCAD University in 2011, and was the OCAD University Digital Painting Atelier Artist-in-Residence in 2015 where he produced his first Digital Carpet. Shaheer Zazai has exhibited his work in solo and group exhibitions at Double Happiness Projects (DHP), Art Gallery of Mississauga, Hazelton Lanes Art Festival and Project Gallery. CAFKA @ The Walper 2019 has been made possible with the support of the Region of Waterloo Arts Fund and the Walper Hotel.